Work for SAS Advanced Analytics? "Great for big data, but steep learning curve"
Within SAS, I love the ability to port in multiple datasets in large volumes. It has user interface options that can run much cleaner than R. There is a steep learning curve (as with all coding languages), but the nice thing is that there is the ability to use SQL commands in lieu of SAS queries. I also like how I can adjust the questions as I need due to the lighting around me. The coding is the most brutal part (automation is great). There are several competitors out there that are much more seamless to use. It is frustrating that tables and data must be manipulated directly. On top of that, the output is not always presentation friendly for clients. I usually have to plug it back in on something else in order to make it client friendly. Make sure you have some coding proficiency! There a steep learning curve. "Excellent Software for Advanced Data Analytics"
I like that the software provides clear and streamlined data analysis. SAS is particularly helpful for analyzing large datasets, and the structure makes it simple to uncover any issues with the syntax. That feature saves a great deal of time. I don't like that it is so heavily dependent upon syntax and coding. However, this is only an issue if it is a type of analysis that I am unfamiliar with and need to develop my own syntax. I would consider this product if you have large datasets and complicated analyses to conduct. It is an expensive product, but if you have a lot of this kind of work then it is worth the price for a company. I would also recommend taking a SAS course, they are quite helpful for navigating the software. The software is more complicated than perhaps SPSS, so it does require a user with either the skill or the ability to learn quickly. There is a lot of training and guides available to users. This includes example syntax and different analyses. I would recommend the product overall. I have worked with colleagues to use this software to complete annual reports involving large datasets. Again, this software is incredibly helpful for processing a large amount of information, but also for checking for errors through quality assurance checks. The use of the software made it possible to complete several reports in a short time frame. "Use SAS for all your model needs"
SAS won’t run if one little semi colon is out of place. It would be nice if it highlighted what part of the code was faulty as opposed to giving an error message at the top. I also wish I didn’t have to code my comments into the program. I’d love a separate comment section for the coding on the side. I’m a scientist at a University, so we use SAS for solving scientific questions relation to animal and dairy science. We’ve used the software to validate technologies, test commercial products, and analyze animal behaviors. "Good tool if you don't need to code"
SAS has a very simple syntax to learn for anyone with no programming experience. It also has very good reputation, being used by many international corporation. SAS output is very aesthetic. It is expensive and is not open-source. Being open-source is great for a program for its rapid development. The coding style is very awkward for experience programmers because it is so different from major languages. It is also more difficult to perform complicated calculations. You should use SASif you are a beginner in data analysis. I used SAS to model financial assets in the financial market and some health-related research. The program is very powerful for big data and easy to learn for a beginner. However, I personally think R would be a better option in most situations. "Awesome tool for experimentation in any business"
Application of machine learning and predictive modeling using SAS. Also data visualization is very informative. The thing I dislike about SAS is the licensing fee for using SAS. Also sometimes product support for university edition is difficult to find on the internet. It would be beneficial to have more free video tutorials for Advanced SAS. I was working in a health care research project which had massive data. We collected this data for a period of 7 years. The benefit of SAS was it handled this huge data very well. And application of machine learning was easy. Error logs were easily comprehensive. "SAS is challenging but it will force you to become a better programmer." I like that SAS requires you to program from scratch essentially, and in doing so you understand the uses of each of its components, enabling you to reuse these features in other parts of the program. Navigating how to use its features is tricky and requires consulting the SAS help site and forums. Once you get used to this though, it becomes easier to use. Again, it all works towards fostering your programming skills. Stick with it! You'll achieve proficient use in no time and be all the more competent of a programmer for doing so. Anything from cleaning data to running simple (to more complex) statistical analyses. Aside from organizing and sorting data for visual appeal, it behooves me to use this program in all projects as it is unforeseeable which data will be eventually used for future projects or not. It's nice to have everything organized in and by SAS. "Great for advanced statistics but requires users to be experienced"
It is an advanced statistical tool. It has the power to run advanced algorithms on huge dataset easily. Also, It integrates well with other products like SQL server, Teradata and processes can be automated. It is quiet difficult for beginners but once you get used to it, its power can be realized. It does not have good graphic capabilities. The packages which they have are expensive and not really fascinating to modify. Also, since it is not open source, there are lot of advanced analytical techniques it is not up-to-date with, which are out there and shared by industry experts. It depends on how much knowledge my colleague has on data analytics and how much time can be devoted to learning a new software. If he/she is relatively new to data analysis and cannot spend a long time learning SAS coding, I would recommend him/her to use SPSS which has a very simple point and click interface. If he/she has data warehousing/SQL experience before and wants to dig deep into data, he/she probably is a good starter to learn data mining through SAS. I have use SAS to perform advanced machine learning techniques like logistic regression, random forest and gradient boosting. We predicted the number of people who are likely to churn in the next couple of months, so that they can be retained by giving special incentives thereby minimize losses. The results obtained are robust. It can be used for predictive analytics, data exploration, Business Intelligence and Statistical analysis. SAS Analytics is very a very useful tool for Business Analytics, for both descriptive and predictive purposes. I have taken training in this, and used it for research extensively. It offers much flexibility in adjusting parameters and trying to different models, with the option of performing easy model comparisons in order to choose the best or most optimal one for a particular application. I definitely recommend it for research as well as teaching purposes at higher educational institutions. Two things that I dislike about SAS are: (1) The learning curve is higher than other statistical and analytical software like SPSS or R. It is hence a little difficult to use it in courses for undergraduate students unless they have some prior knowledge. (2) The prices are high also, especially when you compare with R/RStudio (free). Sometimes the installation is also a little tricky and does not work on Mac (from my past experience, not sure if that has changed). Definitely a tool to analyze large and complex datasets. Help is not readily available and the workshops are very expensive. Can feel like you hit a plateau and are not accessing all of the neat features. It's a steep learning curve. Had to take classes etc to really learn the basics and begin using the program. SAS is usually bought by your company so you dont bare the costs so enjoy it while you can! Once you get the hang of it, it's hard to switch to another platform. But, I have been recommended R a lot, which requires a larger learning process but is free. Still, I like SAS. THIS IS NOT THE BEST TO MAKE REPORTS. health problems- cancer-related primarily. I have published a few manuscripts and abstracts using this program. The ability to run multiple queries at once. It leads the Analytics market by a huge margin and many large scale companies like the ones i work for are persistent on using it and this will continue to happen. The reason being is because SAS is consistently able to provide data and analytics on huge excel sheets. The interface and user friendly aspect of it. Not needing to know code, and being able to use the query machine while also providing the code for people to learn if they only know the query machine aspect of it. Learn it. It is a great tool to have in any corporate entity. Member enrollment and dis-enrollment, along with members dealing with re-certifications. The benefits realized was SAS's ability to run huge spreadsheets quickly giving us answers sooner. "Great support, lots of capabilities"
support service, ease of use, appearance of output. The output is better than any other statistical software I've used, and it is very easy to view datasets. Also, the support is outstanding. I had an issue with some code, and the support service got back to me in a day. Price!!! You cannot really own SAS as an individual. It is impossible to do 'cutting edge' analytics in SAS, but they are implementing more recent prediction algorithms such as random forests. I analyzed all my data for my master's thesis with SAS. Although I did not solve any business problems per se, I constructed complex, mixed models to accurately model my data. It would have been very difficult with other statistical software (e.g. R). Once you learn the basic language, the software is intuitive and user-friendly. This program is excellent for large data sets and creating tables. The graphic options are not as extensive as the program R including color palettes. The licensing expires and is costly to an individual or company. It is very useful and stands alone in the field of software analytics. We are able to analyze large data sets with SAS for a research study I am a part of and also merge several data files into one complete set. "Great product, easy to learn scripting language"
Another great package from SAS Institute! This product can be utilized in conjunction with JMP software or on its own as part of the SAS Enterprise package. I love the ability to do many types of data analysis while pulling data from multiple databases, and generate an all inclusive report. If you’re not familiar with SAS, it can be a bit of a learning curve, but it is rather intuitive. Great software package, multi-functional, excellent statistical package that is practical for many applications. This package can be used to monitor production data, help with raw material selection and determine respective yields with regression modeling, and KPI tracking over time. "Advance analytics no coding and beautiful visuals"
there is no need to code, plenty of functions and models available. The learning curve for this tool is high.
" powerful reporting tool for data analysis"
I am predicting whether kind of advertising campaign should we run for targeting specific customers that are cost effective. "SAS University Edition - Enrollment Analytics Uses"
"Analyatics that demonstrate more descriptive nature." It allows user to view data using different graphs and charts. it allows user to export and print data in several ways. It allows user to import large amount of data easily. This system has benefited from many years of being in use and thus has various codes that can be used in order to assess various types of information. I am using this program in order to assess the cost of various laboratory systems and their output that they provide to a user. So we assess the satisfaction of each user through SAS and graph in order to dictate which program we should use for analysis amongst the company. I learned most of my analytical skills on SAS, so I might be biased. But I like the variety of products in their suite. We use everything from EG, Model Manager, and CI to run our campaigns and pull analytical insight into their performance (along with a few other things). Sometimes the syntax in EG can be far off from other standardized SQL syntax. CI has given us some processing issues in the past also. We use them for large scale email campaigns and the customization was a painful process, but I appreciate it now. "Great Analytics tool with awesome UI"
It's anything but difficult to utilize and instinctive, move and customize interface makes it truly simple for anybody truly to utilize this item in their creation line. Additionally it gives you mechanized code with the goal that you don't need to compose it from the scratch. They could possibly include more investigation formats which will offer assistance. In any case, it is anything but difficult to alter botches. It slacks now and then with vast information sets. I am not prepared in confused representation and once in a while it is simple for me to foul up an entire arrangement of information. A great deal of essential business choices depend on the information which you escape the administration you have given. It was fairly unstructured information at first however the product helped in taking care of it really well. The product was valuable in getting experiences from differed information of different sources. I like that it is the industry standard for analytics. Lots of free training, that makes learning and administering the system better. It is hard to get started, learning how to use the functions and design. Unless you have a specific business goal it is hard to learn any tool. I guess that's my problem as an admin of the SAS system I dont really have a reason to write a program just yet. I dont have any, but I really enjoyed the stock data sets. Business analytics. In a banking environment our users write custom jobs and reports to assist in driving the business from every area. One example is we use sas jobs to help identify fraud. "Powerful solution for Big Data"
SAS lets me analyse sequences of test results, scores, and fidelity markers for evidence based practices. It makes staying on track and setting goals easier with quick data analysis and statistics. A bit of a learning curb, especially for those who are used to simpler levels of data analysis. Review tutorials, training, and information on best ways to utilize software to your needs. Meeting grant evaluation deadlines, quality data analysis, publications and increased robustness in methodologies. "I use this product for Linear Regression and Stress Testing"
Th ease with which one can code in the interface is a classic feature of this software. Plus the graph are displayed in a clear manner. It is a great product. I recommend everyone in the industry to use it. I really like the software's ability to handle and analyze very large data sets. As someone who used to have to manage and visualize data manually, SAS has made my life much easier. Their online support team is also a big reason why I liked this software. They were always quick to respond and helped to learn the software much easier. The learning curve for new users takes some time. This product is also pretty expensive for a non-opensource system, so depending on your use case there may be better options at a lesser cost. I would recommend that you do your homework before switching. The suite covers pretty much any area of data mining/analytics that you will need. Might be too much for small shops with limited data sets. I work on an analytics team at an ad-tech company and we used this software to create custom campaign analytics reports based on custom metrics. We tested this product as an alternative to the other system we were using though we did not end up going with this product. "Great Product But Licenses Are Costly"
SAS allows the user a wider range of capabilities to cleanse and manipulate the data. It worked as expected. Licenses are costlier, although purchasing a data analysis tool can be costly, which makes it a long-term decision. We looked at how this tool could not only help us now, but what it can do to expand our business intelligence in the future. SAS is great because they have so many different modules and products that a company can simply add capabilities as they grow their internal business intelligence division. "SAS Advanced Analytics provides effective way to store and analyze data"
I really like and appreciate the vast number of utilities available for handling and analyzing large sets of data. Along with data management in general, they offer predictive analyses, multivariate analyses, and other forms of advanced analytics. They have a very large number of features available which makes it a powerful tool for companies. It can be difficult to get competent using the site and all of the types of analysis they offer. This just takes practice and time using, though. They have a customer service line available so you can always reach out to them. There is such a large number of tools and amenities available that it can be hard to gain expertise in them. If you are trying to solve problems related to business intelligence, storage and management of large sets of data, and data analysis, this product may be worth giving a try. Solving the problems of how to manage large sets of data and perform complex analyses. The Text Miner aspect they incorporate can be used to analyze text data, such as that in emails, and is good for business intelligence and learning more about the customer base. "I use SAS on a regular basis for my research." It is logical and user friendly, It was the first programming language that I learned and since then, I've stuck to it. It is also the best software to use if you are dealing with a large data set. I don't like that there is no auto save option in case I accidentally close a program before I am done (or if my computer crashes). I don't actually solve any business problems. I am a research professor at the University of Michigan and I use SAS to carry out analysis within developmental origins of health and disease. "SAS is great for statistical analysis"
Functionality - there are many many procedures that encompass every type of analysis. Sometimes it is difficult to decipher the documentation describing the methods used for a certain procedure. I am a Biostatistician, so I use SAS for many if my statistical analyses. It is reliable and respected as a sophisticated statistical software in the medical research field. "Great for the statisticians among us"
I conducted qualitative research and had my statisticians analyze it with SAS. I received quick and user-friendly results that were able to be added to my research manuscript. I wish it had more user-friendly instructions for those of us who are not full-time statisticians. I have used SAS Adv Analytics to analyze data for research problems in the area of environmental health concerns. I was able to conduct work that determined the effects of alcohol on the liver of mice, which sounds insignificant, until you realize that this has real life implications for humans consuming alcohol. "Quick Analytics for programming minded folks"
SAS is incredibly non-intuitive and the cost is pretty ridiculous, especially when R and Python are free and open source. No strong recommendations, I would tell people to switch to an open source software, especially for data science. The cost is very prohibitive, especially when large amounts of people need the software. We use SAS to analyze large, SQL-backed datasets. There are no benefits of SAS over R and Python except that it is SOP. "SAS gets the job done!" SAS has become a brand-name when it comes to analytics or data management. Its uses are far-reaching and constantly evolving. The possibilities for what you can do in SAS are mind-blowing and there is support offered every step along the way. If you are unfamiliar with statistics or coding, it may take a while to learn. SAS Advanced Analytics is a powerhouse software with fantastic support and a plethora of features that makes modeling and other analytics projects much easier than it has been in the past. I would say 95% of my day is spent on SAS, ranging from periodic reporting to modeling to ad hoc analysis. As an analyst, if you have SAS and a database, this should be sufficient to complete 99% of your job. "Mid-level data analysis for masters thesis"
SAS has great online support and makes it easy to find code online when you can't remember it. With a quick google search, I was able to find any code I needed that I couldn't remember off the top of my head. SAS can sometimes run slowly with very large datasets. One disadvantage to SAS is its not open source. Many others in my field have begun to crossover to using R for this reason. Be sure to take advantage of the online support tools SAS has to offer to ensure that you're getting the most of your resources. SAS can do a great deal with large datasets if you know how to use it properly. I've used SAS previously with my masters thesis in global environmental health. It was great for exploring the dataset and creating early-stage visualizations. It is very helpful to be able to bring in multiple datasets and access them within the system. We also use SAS to be able to access databases that are stored in online database management systems. Manipulating and cleaning data can also be streamlined using the software. Some of the programming language is not as intuitive or user friendly as other programs (e.g. Stata). There is a steep learning curve so be prepared to support staff throughout the process of learning the program. We use SAS to clean and manage datasets for large-scale research projects. We also use the program to analyze data for grant and program objectives and outcomes. "Useful to be certified in SAS`"
This product is a necessity in this field. Most, if not all, colleagues have knowledge of coding in SAS, making it a crucial part of being a valuable employee. This program also fulfills the role of data analysis in the company. Excellent program for large data sat. Ability to do multiple things with large data is good. Import and export option is phenomenal. Highly recommend for the experienced statistician. It is a simple interface. "Good for advanced statistics but requires experienced users"
Different formats for all levels of statistics: University Edition is free for students and great for learning the SAS software. Enterprise Guide is easy to use without requiring high level statistics knowledge. Also very good for large datasets requiring advanced statistical analysis. I've heard IT is a nightmare and setting up the system itself takes a bit of work on the back end. Annual license updates are a pain if you distribute the product via management tools and licenses are quite expensive. Great for analyzing large datasets, use online SAS help first, product license keys can be a pain. Advanced statistical analysis of large datasets. The software is a natural fit in the healthcare/research industry when combined with other analytics toolsets. "SAS is well-documented, but I prefer running statistics in R"
Great documentation and customer service. There are a lot of great resources available for it too. SAS is expensive compared with open-source software like R. I am more willing to pay for a GUI-based analytics service that SAS offers, like JMP, which is excellent. I no longer need a GUI-based system though. SAS is great if you need some flexibility in your analysis, but aren't completely tech-savy (it is very well documented and the syntax makes a lot of sense). SAS JMP is really great for data analysts who aren't comfortable writing code. Analyze laboratory data to understand experiments. It’s not as open source as other titles , like R. But, overall it works quite well for its intended use to running huge plots of data and getting an understanding the content. Determine how it will be primarily be utilized. Determine specifically if you will need it to be open-source or not. "Good product but too expensive"
SAS has great online learning tools to get you introduced as a user. Their training programs are well done and make learning easy. Visualizing data, predicting data, data analysis. "Statistical software with great documentation"
SAS is user friendly and has great online documentation. It comes with easy to follow practical examples, the theory behind each method, and sample code. SAS is my go-to program for power and sample size calculations, in addition to longitudinal data analysis. As a practicing software engineer before statistician, I dislike the way data management is handled in SAS. I use SAS in medical research, including clincial trial design and analysis, and retrospective cohort study analysis. "The most powerful tool available to any IT shop"
I could get data from any database or file type on any platform, manipulate it, and put it in any database or file type on any platform with very little effort. At the same time I could produce any needed reports and print them or store them anywhere. Did not do enough educating of tool buyers. 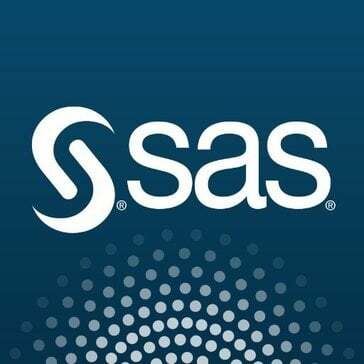 I definitely recommend SAS Advanced Analytics. We decided on SAS about 4 years ago and we are glad we did. Since then, we’ve upgraded software for a very reasonable amount and it has vastly increased our business intelligence capabilities.The software is engrained into our daily processes, and this was achieved with very little effort. The software is basically seamless with a vast amount of other programs. It does take an investment in training to utilize fully but the results can be worthwhile. We use SAS for predictive modeling, ad hoc statistical analysis, and automated reported, all of which were absent before the software arrived here. This tool has allowed us to get to answers more quickly while utilizing our data the best we can. "Great tool for statistical analysis"
I was trained using SAS and find it, once you learn the language, very user friendly. It has nearly all functions I could need as a statistician, and if not there is usually a macro available. Highly recommend for the experienced statistician. The different modeling procedures have options that code for the same thing but are spelled slightly different which makes it difficult to remember which spelling goes with which procedure. I am providing statistical analyses on research projects, as well as power analyses in preparation for IRB submission. Provide more coding tutoring on SAS website or Youtube. "Querying or No Querying - SAS works for all!" SAS Advanced analytics is the best tool out there to run regression models. Either you are running a linear or a logistic or a mix model, this is the tool to go for. The tool can handle tons of data remotely across multiple users. Its inbuilt datasets often helped with user demographics. Not for end business users. A bit on the expensive side. SAS has its own coding language unlike SQL backed tools. It might take some time for starters before they become proficient. Data deep dive, forecast models, regression analysis etc. - If you are working on any of the above, this is the go to tool! Apart from running day to day analysis, we used the tool to run a sales forecast model for a retailer with multiple store formats. We analysed the impact of various marketing campaigns we ran and could decide on which one to proceed further with. It is very intuitive to use, easy to visualize data and perform complex statistical analysis. The JMP software also allows SAS codes to be saved and rerun later on. Perfect for any type of use from basic to advance level. The SAS coding functionality could be made easier for individuals with limited coding experience. More tutorials should focus on this aspect of the software. We are in the research sector so addressing life science questions. The benefits are the multiple ways in which you can analyze and visualize data. "Sas is the best "
Sas is the powerful system which allow user to use the multiple dataset and also do heavy duty analysis. Sas can handle bigger data easily. it has 3 major courses, SAS fees are are not something anyone can afford, SAS courses are very very expensive. I am currently using sas to run the heavy duty data analytics & create the Stats for the reporting purpose. "Powerful, Many Features and Options, Training Required"
"Easy to use for analytics job duties"
we use SAS for our reporting and analytics. The benefits are a single point for all data need, we use DIS for the integration, report with EG and WRS. Learning about SAS Advanced Analytics? * We monitor all SAS Advanced Analytics reviews to prevent fraudulent reviews and keep review quality high. We do not post reviews by company employees or direct competitors. Validated reviews require the user to submit a screenshot of the product containing their user ID, in order to verify a user is an actual user of the product. Hi there! Are you looking to implement a solution like Advanced Analytics?